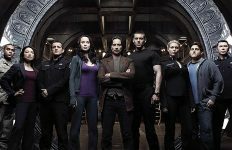 It’s a full-blown mutiny on board the Destiny as SGU blazes into the back half of its first season. In this installment the conflict between the civilians and the military contingent reaches a boil in “Divided.” Who will blink first? Then, in the episode “Faith,” Lt. Tamara Johansen and others consider staying behind and settling permanently on a paradise planet. Camille and the others find themselves at gunpoint when their insurrection fails. After Rush and Chloe shared the experience of being abducted by the CGI BlueBugs, they seem to be bonding over their trauma. Knowing what Rush and Camille are up to, I wonder if Rush won’t eventually try to recruit Chloe into their conspiracy. She seems to be disillusioned enough that I could see her at least considering the options. I’m still unclear as to what the conspirators’ plan is, exactly. I know they want to have Colonel Young removed from power — which I almost feel like General O’Neill would back them on if they’d just follow the chain of command. O’Neill was pretty pissed with Young when he wouldn’t go along with the plan to try and get everyone home. Instead, we end up in this weird standoff of civilians versus military Brady Bunch “divide the ship in half” plan. I certainly understand Rush and Camille’s motivations to play mutiny. But the rest of the civilians, as under developed characters, don’t have any real motivation for joining their side … other than they’re not military. Knowing that this was where the show was going to take the plot, I wish the writers had spent a bit more time setting up the mass mutiny. Why are more people choosing the path they choose? Same goes for Chloe. Hers feels like the biggest betrayal. The crew is forced to operate in less than ideal circumstances to save Rush’s life. Maybe they could have shown a bit more of Chloe and Rush bonding? I guess the writers implied that with the “Same dream again?” conversation — but it still feels a bit rushed. Or maybe this episode could have been a two-parter in order to better set up the mutiny. With an additional hour here they’d also be able to set up CGI BlueBugs as a more fleshed-out threat. As it stands, the CGI BlueBugs just seem like obnoxious Ancient fanboys more than anything. They want to get their hands on this old ship the Ancients made. And the civilians come across like whiny younger siblings, who are too grown up to be told what to do and want to stay up later than their bedtime. Rush, Camille, and Chloe are the only ones who seem to have any real motivation. I like that everyone was willing to come together to remove the tracking device from Rush’s chest. This gave the entire crew of the Destiny something to bond over. But I cannot forgive them for performing surgery with their hair down looking all cute around their shoulders! I know we’re on an alien ship and ill-equipped to deal with open-chest surgery. But a few hats and ponytail bands would have been a nice attempt. This episode really feels like it would have done better with at least one other episode to set it up. It looks like the ramifications of this episode will continue (which I’m glad about). One thing the franchise has always done well is carrying actions forward, and not just resetting every episode like the last one didn’t happen. 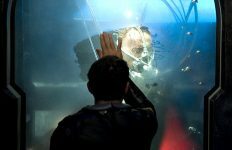 The team finds an Eden planet … and bad history with aliens be damned, we’re going to hang around, leave a team, and take our chances? This doesn’t seem like the best idea after half the crew just tried to overthrow the other half and everyone threatened to kill everyone else. But, sure, lets just leave a group on a weird planet for a month in the hopes of finding apples and aspirin berries. Scott and Greer lead the away team and must wrangle a bunch of ill-equipped civilians, most of whom haven’t even gone camping. Along for the ride is a group of military personnel who want payback for the attempted mutiny. On a short hike T.J. gets faint and must take a breather … I think she’s pregnant? Am I just so used to that plot twist that I expect it everywhere? On Planet Eden, The Chosen settlers have philosophical debates about greater powers and lower-case-d-destiny, and fate. 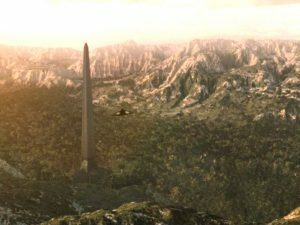 The crew discovers an ancient obelisk erected on the Eden planet. Dude, T.J.’s tossing her cookies … she’s totally pregnant! Am I to assume Young is the father? 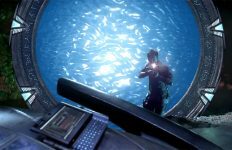 Although this happened on Icarus, so I suppose it could be anyone on the ship — or even someone who didn’t make it to the ship. But my money is on Young. 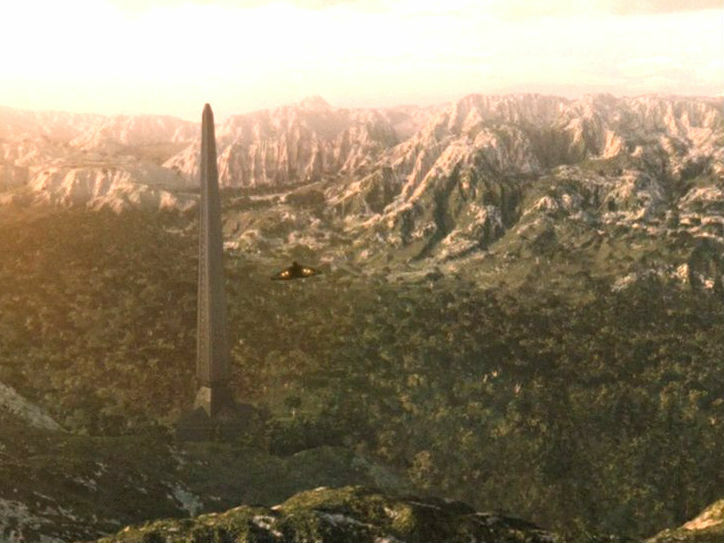 Using the shuttle’s radio Planet Eden reports that there is a strange light emitting from an obelisk on the planet, and they’re not sure what it means. It could be calling back the aliens that created the planet. Or celebrating the summer solstice, for all we know. But it seems The Chosen will have to head back to the Destiny without knowing. Or, as some people seem to want … they will stay on Planet Eden with the hope that the aliens that built Planet Eden will be able to help them get back to Earth. Or maybe they will let them stay on the planet, just because it’s safer and there is food. T.J., of course, wants to stay because she can’t stand the idea of raising her baby on the ship. Lt. Scott decides he will stay because someone responsible needs to help those who stay behind. It makes me wonder if he’s referring to the military people because they are enlisted personnel … or just T.J. because he doesn’t want her to leave. The way he acts back home with his wife, Emily, I feel a bit like it’s just T.J. he’s worried about. Scott can’t look Young in the eye when the Colonel tries reasoning with him to return. T.J. quietly accepts that she has an obligation to the people on board Destiny. It still feels mostly like she couldn’t say no to Young’s face more than that she believed his reasoning. Scott, I think, was using T.J.’s want/need to stay on the planet to justify wanting to stay himself. If anyone was going to believe that a higher power put that planet there to help save them, it’s going to be Scott. We’ve already seen his religious leanings in previous episodes and while he tends to keep it to himself, he is a man of Faith. In the Next Installment: Rush explores his past in “Human,” and an away team investigates some ancient alien ruins in “Lost.” Stay tuned! 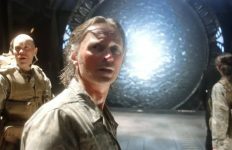 Read more about “Divided” and “Faith” in GateWorld’s SGU episode guide. The guys at GateWorld discuss both episodes on the GateWorld Podcast.